Dustin was elected as Representative for House District 83 in 2014. Re-elected in 2016, in 2018 he won HD-83 with 77% of the vote. Dustin currently chairs the House Ways and Means Committee, and the Republican House Caucus. He is also a member of the Legislative Audit Committee and the Committee on Elections. HD-82 encompasses a portion of Lubbock and all of Scurry, Gaines, Lynn, Terry, Mitchell and Borden Counties. Dustin was born in Lubbock and attended Monterey High School. At Monterey, he was involved with FFA, showed pigs and judged livestock. After graduating high school, Dustin went to Rhodes College where he studied economics. After graduating from Rhodes, Dustin was anxious to get back to West Texas. He moved home in 2001 and graduated from the Texas Tech School of Law and the Rawls College of Business with a J.D. and M.B.A. in 2004. 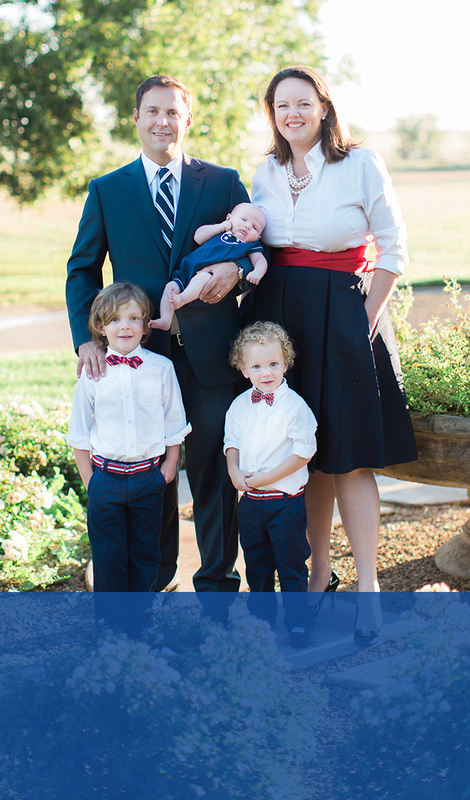 Dustin is a small business owner, practicing law at the Burrows Law Firm in Lubbock. Dustin is married to Elisabeth, who grew up in South Texas in a family involved with cattle ranching and oil & gas. They are the proud parents of three boys, Davis, Whitby and Henry. Dustin Burrows represents House District 83 in the 86th Texas Legislature. Pol. Adv. paid for by Dustin Burrows Campaign.